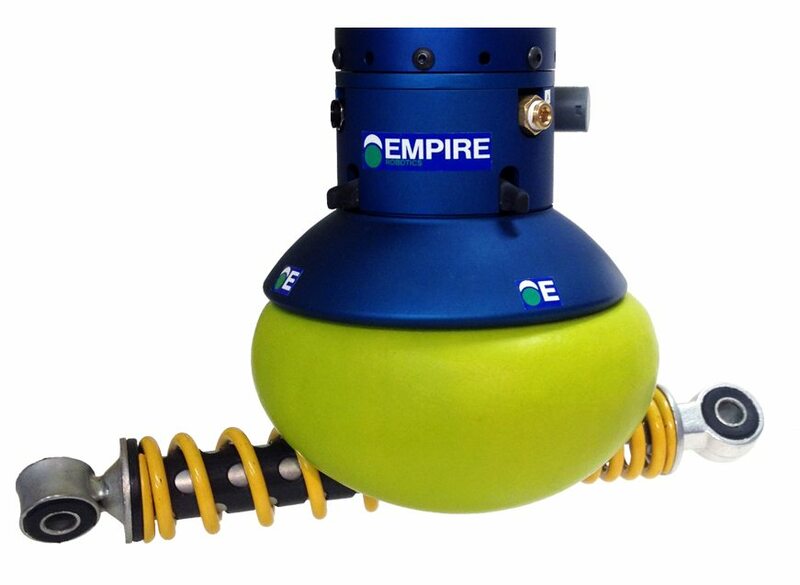 A robot gripper invented by researchers at the University of Chicago and Cornell University is now available commercially from Empire Robotics as VERSABALL for industrial automation, scheduled to ship later in January. Company officials believe the technology might also be useful for prosthetic devices that can assist with work tasks, for in-home assistive devices, and in mobile military robots. Robotic grippers that “jam” granular materials by vacuum-packing first made a splash in 2010 as part of a collaboration between researchers at Cornell, UChicago and iRobot, and funded by the Defense Advanced Research Projects Agency. The science behind the gripper is a physical phenomenon called the jamming transition: granular materials or particles can flow and act like a fluid when loosely packed, but the materials interlock to become rock-solid when packed together. This phenomenon is familiar to coffee drinkers who buy vacuum-packed coffee, which is hard as a brick until the package is unsealed. In fact, early jamming gripper prototypes were composed of ground coffee inside a party balloon. VERSABALL grippers take advantage of this jamming behavior so that when the gripper is soft, it can be pressed against an object — passively conforming to take the object’s shape. The gripper then vacuum-hardens to grasp the object firmly. Gripping and holding of objects are key tasks for robotic manipulators. The development of universal grippers able to pick up unfamiliar objects of widely varying shape and surface properties remains, however, challenging. Most current designs are based on the multifingered hand, but this approach introduces hardware and software complexities. These include large numbers of controllable joints, the need for force sensing if objects are to be handled securely without crushing them, and the computational overhead to decide how much stress each finger should apply and where. Here we demonstrate a completely different approach to a universal gripper. Individual fingers are replaced by a single mass of granular material that, when pressed onto a target object, flows around it and conforms to its shape. Upon application of a vacuum the granular material contracts and hardens quickly to pinch and hold the object without requiring sensory feedback. We find that volume changes of less than 0.5% suffice to grip objects reliably and hold them with forces exceeding many times their weight. We show that the operating principle is the ability of granular materials to transition between an unjammed, deformable state and a jammed state with solid-like rigidity. We delineate three separate mechanisms, friction, suction, and interlocking, that contribute to the gripping force. Using a simple model we relate each of them to the mechanical strength of the jammed state. This advance opens up new possibilities for the design of simple, yet highly adaptive systems that excel at fast gripping of complex objects. We describe a simple passive universal gripper, consisting of a mass of granular material encased in an elastic membrane. Using a combination of positive and negative pressure, the gripper can rapidly grip and release a wide range of objects that are typically challenging for universal grippers, such as flat objects, soft objects, or objects with complex geometries. The gripper passively conforms to the shape of a target object, then vacuum-hardens to grip it rigidly, later utilizing positive pressure to reverse this transition-releasing the object and returning to a deformable state. We describe the mechanical design and implementation of this gripper and quantify its performance in real-world testing situations. By using both positive and negative pressure, we demonstrate performance increases of up to 85% in reliability, 25% in error tolerance, and the added capability to shoot objects by fast ejection. In addition, multiple objects are gripped and placed at once while maintaining their relative distance and orientation. We conclude by comparing the performance of the proposed gripper with others in the field.